Once during Dian Wei's turn, he can cause one unit of damage to any character within his attacking range by either discarding a weapon card or taking one unit of negligence damage. To activate "Assault," Dian Wei can discard a weapon card from his hand or his equipped area. If he discards an equipped weapon, he forfeits the range of the weapon and can only damage a character in his physical range. If Dian Wei activates "Assault" by taking one unit of negligence damage, Dian Wei receives the negligence damage before dealing damage to the target. Dian Wei can bring himself to the brink of death with this ability, but if even if he dies, the target will still receive one unit of damage. Dian Wei's "Assault" directly causes damage. This does not constitute attacking, and the damage cannot be prevented by the use of an Escape. With "Assault," Dian Wei can always cause damage to another character in his attacking range. The target of this ability can do nothing to avoid taking damage. The target of his ability cannot avoid the damage so Dian Wei can take a toll on players that are very set up defensively. 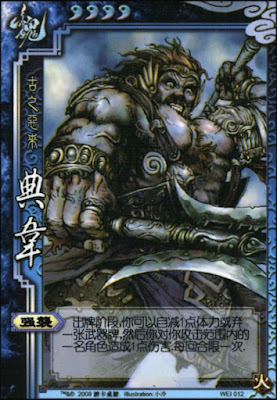 Dian Wei can use his power in combination with cards like Attack, Barbarians, and Duel to deal a large amount of damage in a short amount of time. Weapon cards do not constitute a large portion of the standard playing deck. As such, Dian Wei will usually have to take negligence damage in order to activate "Assault." If Dian Wei wants to target a character that is not in his physical range with "Assault," he cannot discard his equipped weapon to do so. This will cause Dian Wei to suffer negligence damage. Hua Tuo - Hua Tuo can be a great friend to Dian Wei. As Dian Wei receives negligence damage from activating "Assault," Hua Tuo can use "Green Vesicle" to heal him. Zhang He/Zhang Zhao & Zhang Hong/Wu Guo Tai/Chen Gong - These characters have abilities that can be used to supply Dian Wei with weapons and help him activate "Assault" without suffering negligence damage. Sima Yi/Fa Zheng/Xiahou Dun - These characters have retaliatory abilities that make it expensive for other characters to damage them. Because Dian Wei usually has to suffer negligence damage to simply activate "Assault," this plan of attack does not work well on these characters. King Dian Wei is not a good king choice. "Assault" drains Dian Wei's life and makes it easier for the rebels to kill him. Loyalist Dian Wei is a good loyalist pick. "Assault" can be used to consistently damage rebels on each of his turns. Remember that even if the loyalist dies, he will still win if the king wins. As a result, Dian Wei's life is not so important that he cannot afford to lose health via his ability. Rebel Dian Wei is a good rebel. He can target the king with "Assault" in an attempt to end the game quickly. Like the loyalist position, he can still win if he dies and his teammates complete their objectives. Spy Dian Wei is a poor spy pick. The spy must be able to stay alive for a long period of time. Dian Wei's "Assault" does not help him in this endeavor. Dian Wei is very strong offensively, but not defensively. If you like to deal a large amount of damage in a short amount of time, you will like Dian Wei. When using Dian Wei, use your "Assault" carefully. If you are using it against a character that has fewer units of health than you do, you will have an advantage. However, if you are using it against a character that has more health than you, you may find that this power will simply lead to your death. If you only have one unit of health remaining and you do not think that you will survive to see your next turn, consider using "Assault" to kill yourself and damage an enemy. This is an effective technique if you are a rebel to ensure that the king or a loyalist will not draw your three-card bounty.